I love looking at the things on the new books display, so I thought I would select one to share with you – Eileen Gray: Her Life and Work by Peter Adam. Eileen Gray is celebrated as a pioneer of modern design, one of the most influential designers of the twentieth century. Beautifully illustrated, it is especially recommended for anyone with an interest in architecture, interior or furniture design. We have two copies; one is currently available from the new book display on the ground floor of the library. You can see the location and availability of the other copy on the library catalogue. 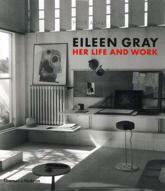 If you are researching Eileen Gray, have a look on the Discovery Service to find lots more information.